​Alex Iwobi has been a largely divisive figure among Arsenal fans and critics alike since his breakthrough into the Gunners’ first team in 2015. The Nigerian made great strides and impressed many during the initial phases of his senior career in north London, but his somewhat stuttered progress since then has left many unconvinced by Arsenal’s number 17. Away fans chanting "oh Alex Iwobi" in unision, couldn't have imagined that last season. He and Torreira have been Arsenal's best player... and now Torreira is down with an injury. The energy and work rate of the forward have rarely been in question, but ​Iwobi’s end product has often left much to be desired over the years. A lack of decisive impact on the pitch has generally frustrated those waiting to see the academy graduate truly unlock his sizeable potential at Arsenal. Under Arsene Wenger, Iwobi generally flattered to deceive. His hard-working contributions often saw the Nigerian selected ahead of the likes of ​Mesut Ozil in big away games last term as the French manager sought to tighten his side up, but his inability to score goals and create assists resulted in a lack of clear definition in terms of Iwobi’s role in the side. Fast forward to the early phases of the new era under Unai Emery’s stewardship, Iwobi appears to be finally coming of age. The Spanish coach stressed Iwobi’s importance in his plans, to the surprise of some, as the Nigerian penned fresh terms at the Emirates during the summer, and his performances so far this term have already gone a long way in validating his new contract. Emery implements a far more rigid and precisely instructed 4-2-3-1 formation than Arsene Wenger’s more fluid and less disciplined interpretation of the same shape before him. The new head coach was therefore in need of specialists in their roles to follow his instructions and put his ideas into practice on the pitch. 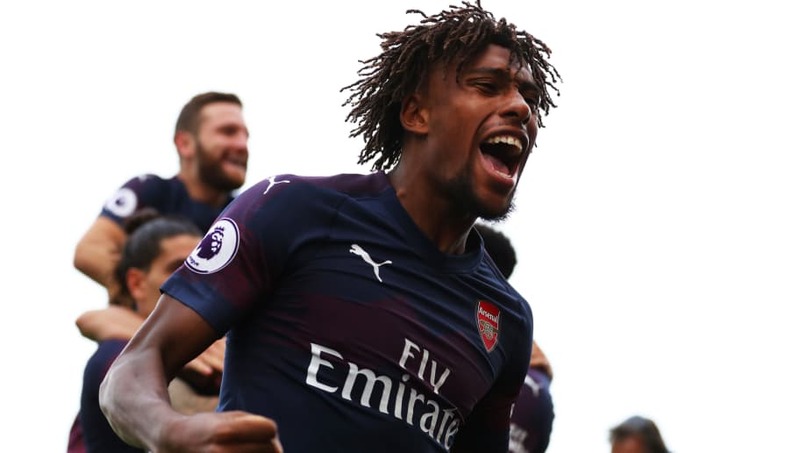 Whilst the likes of ​Aaron Ramsey and even ​Pierre-Emerick Aubameyang have so far struggled to nail down a particular role or an ideal place in Emery’s setup, Iwobi is one of those to have benefitted the most from the Spaniard’s meticulous demands. His ability to play with equal competency anywhere across the advanced midfield three in the formation and a youthful will to learn new ideas and incorporate them makes Iwobi an ideal disciple for Emery’s philosophy and a key component in translating his methods into effect. Not only has Iwobi’s widely recognised industry and work rate been key in meeting Emery’s demands for high energy and intensity from his team, but his technical work on the ball already seems to be coming on leaps and bounds so early within the Spaniard’s revolution. Despite falling out of favour in Emery’s starting lineup for large parts of the season so far, Iwobi has seized every chance he has been given. A thunderous introduction into the recent game against ​Watford as a substitute and a standout display against Vorskla Poltava in the Europa League saw Iwobi stamp his ever-growing influence on his team and on matches. Iwobi’s bursts of energy and bustling work down the left flank are currently succeeding in running ​Arsenal’s opposition ragged on a weekly basis. Consistency was something Iwobi previously lacked, but seems to have discovered with aplomb under Emery. His excellent recent run of form continued with successive starts away to Qarabag FK in Europe and on the road in the 5-1 win over ​Fulham in the Premier League, both of which saw the Nigerian continue to grow in stature and importance as an exponent of Arsenal’s new wave. An outrageous piece of control which saw Iwobi produce a nutmeg against his opponent during the win over Fulham epitomised Iwobi’s recent evolution and his ever-increasing self-assurance. Courtesy of Emery’s guidance, it is breeding both individual and collective results. The increased confidence in Iwobi is reflective of the renewed winning mentality and ruthless desire to succeed which now permeates Arsenal under Emery. Now just two points off the summit of the Premier League, the Gunners appear to be back in business. Iwobi has been on the books at Arsenal from the age of nine, and his life-long dedication to succeeding at the club earned him his place in the senior setup at the Emirates. Now, his Arsenal DNA makes him perhaps the most important driving force within Emery’s squad to guide his club to new heights.